Leading scientists in the annual Earthwatch debate validated the severity of the situation by declaring ‘Bees are the most invaluable species on the planet’, essential to our ecosystem. And yet experts have warned that honeybees could disappear entirely from Britain by 2018! With the prospect of ecological disaster looming, it’s time to identify the root of the decline and take action to help save the very species our survival depends upon. In the UK, the number of native bee species have halved in the last fifty years, and a number of remaining species are already under serious threat. US beekeepers saw 42.1% of their honey bee colonies die off in 2014-2015, according to a survey conducted by the US Department of Agriculture. In Europe, 9.2% of the continent’s almost 2,000 bee species are facing extinction, according to one assessment. What would a Bee-less world bee like? SOCIAL IMPACT: Bees are essential in pollinating the crops that form our food, so if our native bees die out we will lose a third of our diet. Just imagine a world without all that delicious food. We could survive perhaps on wind-pollinated grains and fish, but dwindling food supplies could lead to wars for control of supplies. In addition, many of our medicines, both conventional and alternative remedies, come from flowering plants. And cotton is another essential product pollinated by the bee, so cheap T-shirts and jeans could be a thing of the past. ECONOMIC IMPACT: Since pollinating Bees are crucial to world agriculture, their extinction would have serious implications for food production; leading to soaring food prices, with many fruits and vegetables becoming scarce and prohibitively expensive. Hand-pollination is extremely labour-intensive, slow and expensive. The economic value of bees’ pollination work has been estimated around €265 billion annually, worldwide. So, also from a purely economic point of view, it pays to protect the bees. ENVIRONMENTAL IMPACT: Bees play a vital role in sustaining our ecosystems as the wild plants they pollinate provide food for much of our wildlife, including birds and small mammals who feed off the berries and seeds bees pollinate. Without such food, they would die of starvation, as would their predators – the omnivores or carnivores that continue the food chain. What’s Bee-hind the declining Bee population? 1) PESTICIDES: A prime suspect is pesticides, specifically the commonly used neonicotinoid pesticides, which attack insects’ nervous systems. Strong evidence suggests that they are impacting on other species such as birds, earthworms and aquatic insects too. Insecticides in particular pose the most direct risk to pollinators. As their name indicates, these are chemicals designed to kill insects, and they are widely applied in the environment, mostly around cropland areas. 2) LOSS OF HABITAT: In the past 60 years the bees have lost much of their natural habitat, (including 97% of wildflower meadows). As intensive agriculture increases and urban sprawl consumes landscapes, bees lose much of the area where they would have foraged for food or nested. Unbee-lievable, So how can I help? 1) CREATE A BEE FRIENDLY GARDEN: You can help attract bees to your garden by planting flowers that will draw them in. Blue, purple, and yellow flowers are most appealing to the bees. The poster below offers a number of flowers that bees love. Friends of the Earth offer a Bee saver kit for a small donation which includes British wildflower seeds and a handy garden planner. 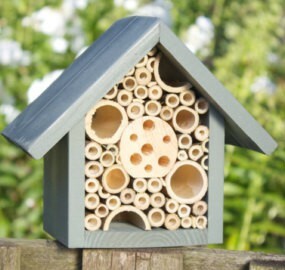 You can also put up a ‘bee house‘ that offers refuge for bees and hibernation spots for the winter months. You can buy these at garden centres, from the internet or build your own. Also avoid the use of pesticides and insecticides in your garden as it can also affect birds and other wild animals as well as bees. helps preserve your own health, but brings huge benefits to wildlife. Protecting our bees will require a shift from destructive industrial farming methods to ecological, wildlife-friendly Organic farming. Our consumer choices can help support such practices, which in turn will help drive the prices down as demand increases. 3) TAKE ACTION: Add weight to campaigns by signing petitions calling for a ban on deadly neonicotinoid pesticides. In 2013 following the success of a people-powered petition, a three year ban on neonicotinoids was ensured in the EU. That ban is coming to an end, so it’s crucial that we ramp up the public pressure again to ensure a further ban, and to make it a permanent one. Click here to sign the petition and tell our MPs to protect the bees. 4) BUY BEE PRODUCTS: Perhaps one of the most delicious options to help the bees is to eat more honey! Creating a demand for honey and other bee products such as propolis, royal jelly, bee pollen etc. will keep the demand for bee-related products strong. 5) BEE-COME A BEE-KEEPER: The popularity of bee-keeping has soared in recent years, so much so that The British Beekeepers Association estimates that over 90% of the UK’s honeybee population is cared for by 17,000 amateur beekeepers. With the added benefits of having your own natural honey supply, more and more people are installing their own hives in gardens to help sustain bee colonies. This is an inexpensive hobby that offers great enjoyment for nature-lovers and honey-connoisseurs alike. There are many small courses available along with books and online information out there on how to go about it. 6) BEE INFORMED & SPREAD THE WORD: The majority of people don’t know about the decline of the bees, so educating ourselves on the plight of the bees is crucial so that we can help raise awareness. The more people who do know, the better. 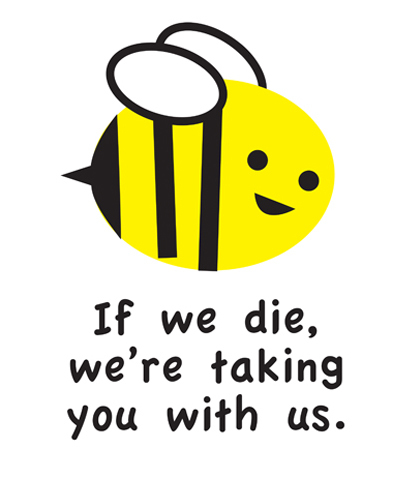 Tell your friends and family about the decline of the bees, post info on your blog or via social media. Write your MP to let them know that the decline of the bees is an important issue for you. The bees don’t have a voice so the more of us who speak up on their behalf, the sooner our governments will take action. 7) SUPPORT BEE CAUSES & CHARITIES: Buying from companies who offer bee-friendly products and back charitable bee causes adding weight to their campaigns. Neal’s Yard Remedies, the UK’s leading retailer of organic natural health and beauty products launched the ‘Bee Lovely campaign‘ in 2011, selling gorgeous products that promote sustainable bee production. Through sales of this range, they are donating £10,000 a year to projects that Help Save the Bees. You can download a booklet on their website on how to help with the campaign. A number of worthy bee charities to support are as follows: Bumblebee Conservation Trust, Plantlife, Bees for Development, and Give Bees A Chance Charity. The plight of our bees is not the first thing that springs to mind when you think of a natural crisis, but the end result should we lose them would catastrophic. Without bees, the very fabric of our lives will change considerably so it’s time for vigilance, and persistent action. Together we can speak up for the voiceless and protect our precious pollinating bees, which in turn, protects our own survival. Why bees are the most invaluable species, The Guardian. Protecting endangered bees: news and resources round up, The Guardian. Hi Emma. Thanks for sharing this important information. I’m wondering if your “If the bee disappeared…” image is available for download and printing? I’d like to add it to our beekeeper’s association booth at the local (Nothwest Washington) fair next month.